You can make a reservation directly on this website by using the "check availability box" to the left and clicking on "Book it Now!" If you need assistance you can call our office at 541-997-1351 and one of our friendly Reservationists will be glad to help you. Is booking a reservation online secure? We implement a variety of security measures to maintain the safety of your personal information when you place an order. We offer the use of a secure server. All supplied sensitive / credit information is transmitted via Secure Socket Layer (SSL) technology and then encrypted into our Payment gateway providers database only to be accessible by those authorized with special access rights to such systems, and are required to keep the information confidential. After a transaction, your private information (credit cards, social security numbers, financials, etc.) will not be stored on our servers. We offer several homes, some of which allow dogs (dogs only) and some do not. You can either look at our properties online by clicking on the "vacation rentals" tab and then viewing "Pet Friendly Homes" above and see if the home you are looking at allows dogs. There is a non refundable $50 pet deposit, with a two dog maximum, required upon reserving your dog-friendly property. Florence Oregon Vacation Rentals is located in our parent company's office (Coastal Property Management) on the corner of Hwy 101 & 20th Street in Florence, Oregon. Our office hours are Monday - Friday 9:00 am - 5:00 pm. What are your Check-in / Check-out Times? Check in is 4:00 pm at our office. We look forward to seeing you! Please arrive between 3:30 pm and 5:00 pm so that we can give you all the details about your property and answer any questions you have. If you must arrive after 5:00 pm, our office will be closed, but we have you covered! Call our office and just let us know you will be late, we will tell you how to get your keys in one of our after-hours lockboxes located right on our office building. What if I get locked out of my rental? If you find yourself locked out during normal business hours, you can come by our office and we will give you a replacement key. Please remember to return all keys upon check out to avoid a key fee. If you are locked out after hours, simply call our after hours emergency line, 541-991-2018 and we will dispatch someone to let you back in. There is a $25 fee for after hours lockouts. 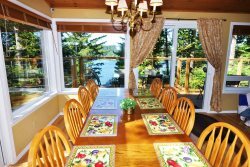 Our vacation homes are stocked in such a way that you always feel like you are coming "home" to your "vacation home" rather than returning to a small hotel room. Our homes have full-sized kitchens with full-sized appliances and offer ample cookware, dinnerware, utensils, and small appliances such as toasters and coffee pots. You will be able to enjoy a sit-down family meal while you are on vacation rather than dining in a small, cramped hotel room. Our properties are fully furnished. The beds come with pillows and basic bedding such as comforters or quilts. Linens, including sheets, pillow cases, towels, wash cloths, bath mats, and hand towels are provided to our guests at no additional cost as well as a starter supply of shower gel, hand and dish soaps, paper towels and toilet paper. No need to pack your own bedding or bath towels like some vacation rental companies require. What Items will I need to bring? You will need to bring or buy your preferred food, beverages and specialty condiments, Personalized toiletries should be considered as well, including your favorite shampoo and conditioner, hair dryer, soap, toothbrush, toothpaste, razor, lotions, sunscreens, insect repellent, etc. You will need to bring your own beach towels. Some properties provide access to a storage shed or garage with beach chairs and toys, some do not. Please refer to the property page on this website or ask one of our friendly Reservationists about your property. Florence provides ample shopping with Safeway and Fred Meyer both located on Hwy 101, as well as other retailers who are able to provide swimsuits, beach towels, fishing gear, bait, and other items of interest. Though we are available for emergency response after hours via our emergency line, 541-991-2018, this is for true rental emergency events such as a busted pipe or water line, a nonworking A/C or heating unit, flooding, or other true emergency. For all other issues, contact our office during business hours (9 am - 5 pm Monday - Friday). We will respond very quickly! If you are experiencing a life threatening emergency, dial 911. If you report an after hour emergency and we dispatch our on-call maintenance and it is discovered that it is not an emergency, you will be charged a $75 fee. We want to hear from you if you need something! If we don't know, we can't help. And we want your stay to be enjoyable. We respond quickly to even non emergency items if you tell us. What if I lost the key(s) to our rental property? If you lose your door key(s) to your property during operating hours, just come by our office. The replacement cost to you is $25 each. All keys given to you at check-in must be returned upon check out or you will be charged $25 for each missing key.